May 15th to 18th : a 4 days full immersion in the cleaning industry, for both exhibitors and visitors, Interclean 2018 just closed its doors. 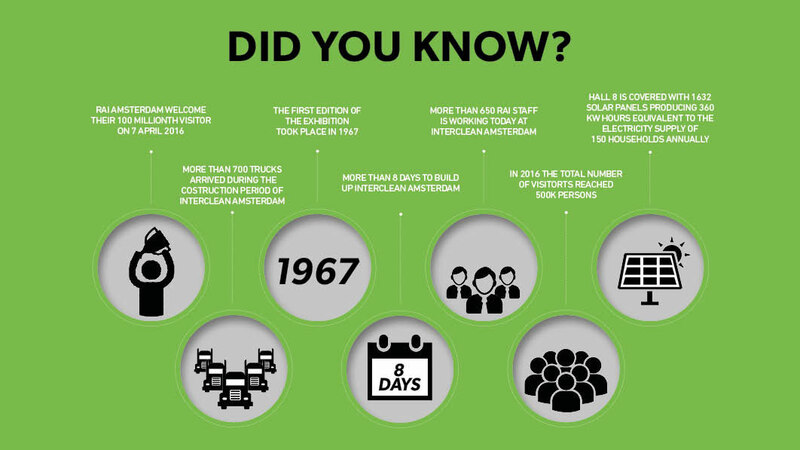 The 2018 edition of Interclean Amsterdam was the largest and the most international exhibition ever. 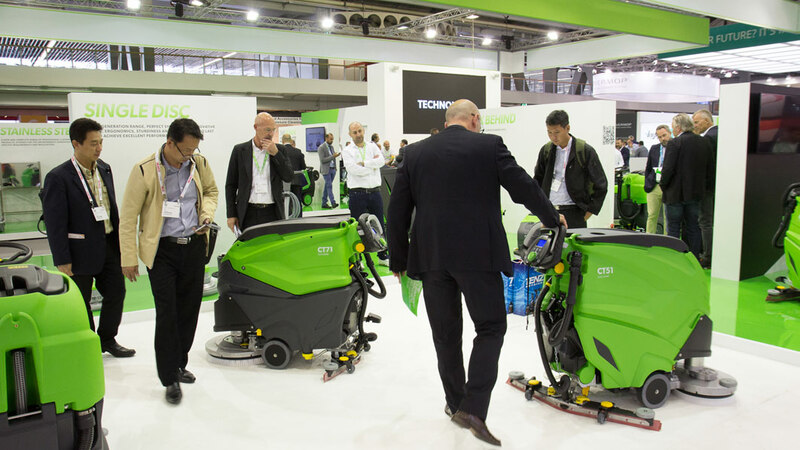 The show attracted a record number of visitors and offered a complete overview of the newest technologies and trends in the professional cleaning market, combining old with new market segments. For IPC, Interclean has always been an unmissable appointment where we showcase the best of our innovative products and, at the same time, an invaluable source of news from the events and seminars which take place during the exhibition. A worldwide presence enclosed in a booth! a comment by one of our visitors during the exhibition. “Interclean is actually getting more and more international. During the last edition there were visitors from more than 140 countries . You come here and find people from everywhere, in a space as big as 17 football fields” – these were the words of Robert Stelling, Product manager Interclean RAI Amsterdam, during the “Young Cleaning professionals” meeting. We can’t help but agree with his comments as we experienced the same feeling. Our booth was constantly crowded with people from different countries, curious about the wide range of products being showcased and excited by the new features we have introduced in most of them. The IPC team was very proud to introduce the new CT51 and CT71 scrubber driers, with smart innovative solutions. They are more than just standard battery powered scrubber driers, as they are literally “4 machines in 1” with new revolutionary interchangeable brush heads. Depending on the user’s needs, the interchangeable brush heads can turn the machine (in four easy steps) either into a single 50/55 cm disc, a twin 70 cm disc or a 55 cm roller scrubber . The Demo Area on our stand was actually designed with the above machines in mind, so that visitors could touch and see their maneuverability and efficiency. The LP new range is the dry vacuum line designed to match the Ecodesign requirements and restrictions. Silent, easy to transport and ergonomic, the LP vacuum can work everywhere, no matter the job. These vacuums are produced with IPC’s exclusive technology Black is Green TM, that features high quality recycled plastics and at the same time promotes sustainable development and environmental protection. All models in this “special” range offer excellent performance in every kind of environment because they are silent, ergonomic and durable. IPC’s PW-C45 is a cold water high pressure washer that incorporates technologies designed to reduce water, energy and labour consumption, and more than 90 % of its components can be recycled. In the large area dedicated to manual cleaning equipments there was no shortage of surprises! 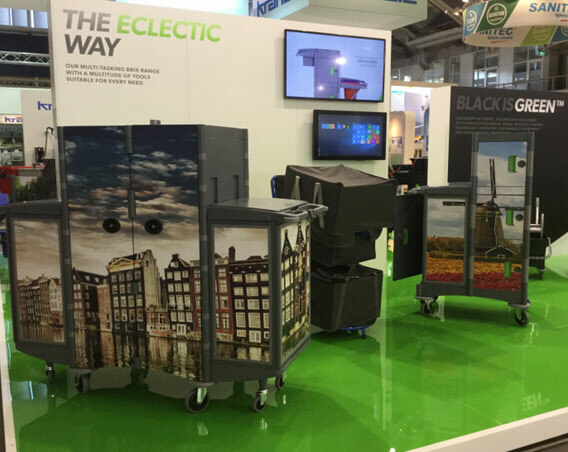 Surprisingly, the Brix Cover Bag trolley system can now turn daily cleaning tasks into a marketing tool! Customizable panels can hide the plain trash bags of a standard Brix trolley and help promote any kind of business or enterprise. The panels are removable add-ons, ideal to be printed with brands, ads, messages or just nice graphics to better suit the context. The Squeegeetech line is the last introduced in IPC’s window cleaning equipment range. Its hero is the Squeegeetech swivel window squeegee: the blade is made with high quality rubber and the handle is compatible with telescopic poles, thus allowing the operator to reach distant cleaning spots. The swivel component is freely adjustable and lockable thanks to a handy little cogwheel that adjusts the tool to a chosen working angle, from 0° to 40°. The “combo” version, with the microfiber pad on the back of the rubber blade, ensures shiny glasses in a single swipe. The Velcro strap makes the replacement easiest than ever. And what about the dedicated stainless steel products area?! For the first time on an IPC booth there was a complete range of solutions (high pressure cleaners, steam generators, vacuums, scrubbers and trolleys) specifically designed for environments demanding specific requirements and conformity to regulations, such as food industry, logistics and transport sectors. We asked the IPC sales team few questions regarding their personal Interclean experience. What is your overall impression of the exhibition ? What kind of feedback did you receive from visitors? “… Feedbacks received have been only positive. Everybody wants to experience IPC’s products directly and with close attention ”. They are also persuaded that: “all customers and visitors have understood and appreciated IPC’s team statement that the Group is now an international leading player in the cleaning sector “. After this exhibition, what could be the next challenges for the cleaning sector? Replies seem unanimous. “ Traditionally the main task of any cleaning activity has been removing dirt by any means. Nowadays we are all aware that the hardest task is how to manage the residuals of cleaning agents and how to reduce consumption of water and energy. The new challenge of the cleaning sector is the development of new cleaning techniques that reduce the quantity of water required, as well as research into new cleaning agents with low or zero environmental impact (such as steam) that could melt dirt easily and be removed mechanically. Properly and efficiently cleaned areas, eco-friendly methods, sustainability of production chain and of cleaning agents… these will be main future commitments for manufacturers“.